Damen Green Solutions’ InvaSave technology has completed shipboard testing onboard the Henrike Schepers. During the shipboard tests, ballast water was taken in untreated and the efficacy of the technology was validated upon discharge. 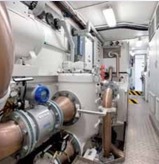 These tests have shown that the InvaSave is capable of providing an IMO type approved backup in a port in the event of a failure in a vessel’s on board treatment systems to uptake or discharge ballast water. It can even serve as a port-based alternative for those ship owners that may not want to retrofit an on board treatment system or be deployed in a port with a sudden outbreak of marine pests. “More and more countries are ratifying the IMO’s Ballast Water Management Convention (BWMC) and it could enter into force in 2017; in any case, it is only a matter of time. Damen is co-operating with the service providers in the ports to provide this ballast water treatment service. This is also relevant for all port authorities, who could face congestion problems if they don’t have a contingency/emergency service in place,” said Damen Green Solutions Product Manager Matthijs Schuiten. Groningen Seaports is the first port to provide this ballast water treatment service. “Our location on the Wadden Sea means that we have a responsibility to push forward the progress of sustainable shipping,” comments Groningen Seaports Sustainability Coordinator Bart van der Kolk. “We are fully prepared for the ratification of the IMO Ballast Water Management Convention.This project wouldn’t have been possible without the effort of some frontrunners like Royal Wagenborg,Van Gansewinkel, Imares, MEA-nl and Damen.” The innovative solution could is likely to appeal to other ports as well as ship owners, operating close to sensitive locations such as World Heritage Sites and Particularly Sensitive Sea Areas. Damen can deliver the InvaSave technology in a self-sufficient mobile container, which can be put onboard a service barge or moved around the port on a trailer or a pontoon.The system uses innovative filtering and UV technology and does not contain chemicals or hazardous substances. Damen Shipyards Group operates 32 shipbuilding and repair yards, employing 9,000 people worldwide. Damen has delivered more than 6,000 vessels in more than 100 countries and delivers some 180 vessels annually to customers worldwide. Based on its unique, standardized ship-design concept Damen is able to guarantee consistent quality. Damen’s focus on standardisation, modular construction and keeping vessels in stock leads to short delivery times, low ‘total cost of ownership’, high resale values and reliable performance. Furthermore, Damen vessels are based on thorough R&D and proven technology. Damen offers a wide range of products, including tugs, workboats, naval and patrol vessels, high speed craft, cargo vessels, dredgers, vessels for the offshore industry, ferries, pontoons and superyachts.